When you decide to make a change in your diet to be healthier, you may run into some roadblocks along the way. The temptation to snack in the evening, difficulty finding healthy choices on menus when you eat out, and politely resisting treats when you’re invited to a party are some of the common ones. Another difficulty that many people encounter when they have changed their eating habits is the pressure to “cheat” at work. This can be a particularly stressful situation since you can be at work five or more days a week. If you work in an office setting, there are some common food pitfalls that occur. Donuts or muffins brought in by bosses, clients, or co-workers. Snacks left around the breakroom by co-workers. Routine celebrations for birthdays, including cake and ice cream. Vending machines that are commonly raided by workers during the afternoon slump time. Runs to convenience stores for comfort food during trying days. Going out after work for not-so-healthy food or drinks. Food and sharing it in these ways can be quite bonding for co-workers, and it can sometimes be difficult to be the one declining to participate. A type of peer pressure can evolve around unhealthy office food. How Can You Avoid Unhealthy Food at Work? There are some ways that you can handle the temptation to indulge in treats, sweets, and snacks at work. Here are a few strategies to consider employing to maintain your healthy ways on the job site. Stand up for yourself. Don’t be afraid to say “No, thank you” and stick by it. The pressure to fit in and bond with your co-workers over shared food can be difficult to deal with, but practice saying “No, thank you” with a smile and moving on. If someone keeps pressuring you after you’ve declined, try saying, “Maybe in a little while” to gain yourself some space. Play an online puzzle game together during break times. Plan an activity night once a month that doesn’t involve food A few ideas for such outings are laser tag, paintball, hiking, Frisbee golf, go-carting, and mini golfing. Ask others what TV shows they like. People can really bond while talking about their favorite show, especially if it’s one with current new episodes coming out, so you’ll have new plot lines to discuss every week. Make sure you always have plenty of healthy food with you. It’s so much easier to avoid temptation when it comes to unhealthy foods if you are prepared with tasty, healthy choices instead. Pack yourself a lunch, snacks, and even dinner when you know you’ll be having a late day. Make sure you eat breakfast. It’s so easy to skip breakfast when you are crammed for time in the morning, but this can set you up for extreme difficulty when it comes to avoiding office junk food temptation. Make sure you have some protein, healthy fat, and complex carbs for breakfast, and it will be a lot easier to decline the donuts. Drink enough water. Thirst is easily confused for hunger. Keeping yourself well-hydrated can decrease your cravings to snack throughout the day; in fact, it can even keep your stomach full, so you don’t feel like indulging. Try to get away from your desk for lunch. If you can step away from your work, or even your office, for lunchtime, do it. Get some fresh air, take in some different scenery, and recharge your health batteries. This will help you to eat your lunch more mindfully and diffuse some of the stress that might trigger you to eat unhealthily in the afternoon. Recruit a co-conspirator. If you have co-workers who you know are also trying to eat more healthily, talk to them. Resolve to bond together to resist food temptations in the office. You can even take turns bringing in healthy snacks to share with everyone, to help override the unhealthy snack food. Keep an emergency healthy snack drawer. There may be times when you forget to bring your lunch and snacks or when you’ve eaten them all and are battling the urge to give in to some unhealthy munching. Maintain a drawer of non- or low-perishable healthy snacks such as nuts, protein bars, and dried fruit that you can reach for during a junk food temptation emergency. Know your triggers. Examine yourself and your habits to determine which triggers are most likely to cause you to give in to the office junk food temptations. Is it when you have a project deadline looming? When a client or customer gives you a hard time? When you are tired? Knowing when you are most likely to fall off the healthy food wagon can help you be prepared with more resolve to get through those times. Don’t be too hard on yourself. There’s nothing wrong with giving in sometimes. If you want to share in the birthday celebration, do it! Just ask for a small piece of cake. Rather than bowing out of participating in the lunch order from the new Chinese restaurant, look over the menu and pick the best choice you can. But if you truly don’t want to participate, just stand firm. 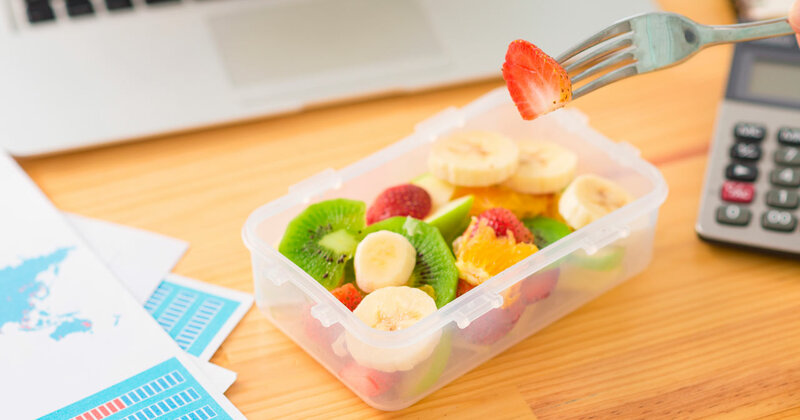 When it comes down to it, the best way to keep up with your healthy eating habits in the office when those around you may not be is to be prepared.